Authors, put your headphones on and listen up: It’s now even easier for listeners to find you and your audiobooks on Audible. Audible recently launched Author Pages to highlight you and provide a homepage for your audiobooks on Audible. Today, we’ll take a look at these new pages and how they can help listeners learn more about their favorite audiobook authors. Your Audible Author Page is your fans’ one-stop-shop for learning about you and your audiobooks. Your page is built on the information you provide to your Amazon Author Central profile, and features your author photo, biography, and your Audible audiobooks. Listeners can find these new pages by clicking on your name any time it appears on Audible: on genre pages, in search results, on your book’s product detail page, etc. You can also direct your fans to your page via links on your website and in social media posts. 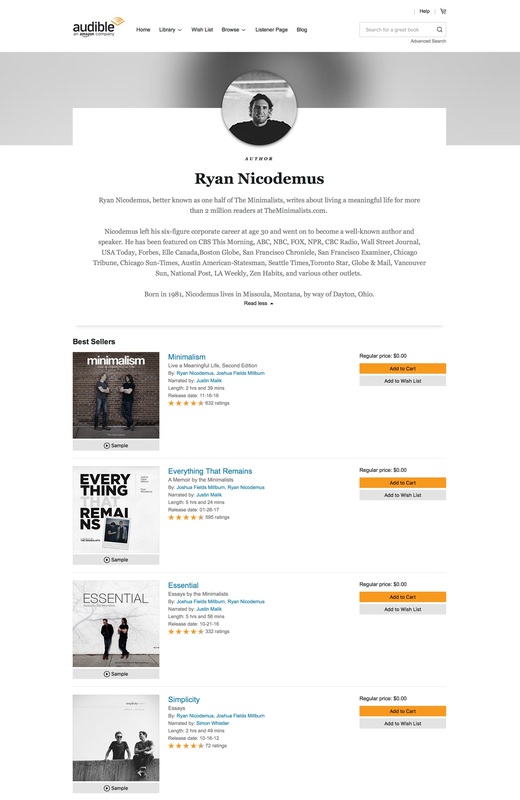 How can you make the most of these new Audible Author Profile Pages? Glad you asked! Make sure you’ve got an up-to-date bio in Amazon Author Central. Listeners love learning about their favorite authors, and it helps you connect with them in an authentic way. Ensure your bio includes your latest links and a clear headshot. Share your Audible Author Profile Page with your fans. Inviting your fans to learn more about you on Audible is a great way to entice them to listen to your books in audio and turn them into lifelong listeners. Audible Author Pages are another tool in your audiobook marketing toolbox. Work regular updates to your profile into your marketing plan, and schedule posts that highlight it to your fans on your favorite social media platforms. With Audible Author Pages, you can connect with your fans, invite them into your world, and give them something great to listen to while they’re there. This entry was posted in Authors + Publishers. Bookmark the permalink. Fantastic job on the author pages. Many thanks to the team that put these together. How about the same thing for narrators? It is clear that many audiobook lovers have favourite narrators, as well as authors. It would be great if this option was available for narrators too, maybe with the requirement of a set minimum number of titles narrated or something. I see my books listed but no photo, no bio! Help! I’m in a unique and possibly singular position. Besides being a published author on the subject of the most effective use of your voice, a subject of interest to public speakers, teachers, students, corporate executives, Voice Over artists, and virtually anyone who speaks, I’m also a narrator for other authored Audible publications. Is there a possible outlet on the new pages for a combination of my offerings? How do I set up an author page? When I click on my name on my book’s page, nothing happens. Yes, can you please provide a link for me to create my Audible Author’s Page? Is there any way to add an editorial review to a Book? I got a 4 1/2 star review from Ind’Tale Magazine for the Audible version of Maybe This Time. I would love to make it show up on the book’s page. This can be done for ebooks on Amazon Author Central. I can’t see how to do it here. Hi Susan, Please email support@acx.com and make this request. Be sure to send them the review and all relevant details. They should be able to help you out. I just tried clicking on my name for several of the ten items for sale on ACX. No hotlink to my profile on Author Central. You’ll need to click on your name where it appears on audible.com to find your author profile pager. Yours can be found here: https://www.audible.com/author/Jack-L-Knapp/B00K35MWNA. I can’t find my author page. How do I find it and add updates? This is great, thanks. One question–my profile shows up all centered, which looks a bit weird. Any way to change that?